Some of the main ingredients in Chinese Food are ginger, garlic, and sesame oil. These are the odors you smell when you walk into a Chinese Buffet. Here are a few tips to getting a better flavor out of your Chinese cooking. 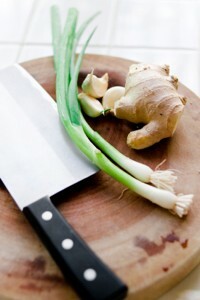 Always use raw ginger or garlic, but this does not mean it has to be fresh. Put both roots in the freezer if you don't use them every time you cook. The ginger will grate into finer powder than when it is fresh. You don't have to worry about cleaning the fibers out your fine grater. They will just grate with everything else. The frozen garlic will peel easier. But I buy the minced kind in a jar you can get at Walmart. It is ready to go and lasts for weeks in the refrigerator. When making stir fry, heat your oil and then put in the ginger and garlic. This will cause these flavors to spread more evenly into the stir fry recipe. You might think it doesn't make a difference but it does. Sesame oil is expensive so use it as an enhancer. Add a tablespoon to a cup of regular salad oil for frying. Drizzle it over the whole recipe just before serving. Stir into the mixture if you have picky guests that might say it looks like the whole thing is swimming in oil. It really makes fried rice have a good flavor. Another way to preserve ginger for later use is to peel it, cutting away any spots and putting it in plain vodka in a glass jar. Over time, the ginger loses its taste to the vodka, but the good news is that you now have ginger-flavored vodka! Since sesame oil is so fragile, I wanted to find other uses for it. So, I also use it as a substitute for tahini in hummus. I get rave reviews for it. Soy sauce and 5 spice powder are essentials also. You can make a wonderful meal using ginger, garlic, sesame oil, soy sauce and 5 spice. Mmm.